It’s the long-standing American dream: to own a house with a white picket fence. Whether that’s your dream or not, fences add a lot to a home in terms of both privacy, security, and safety. For Connecticut homeowners looking to add these benefits to their home, a wood fence is a good option. But before chasing after your dream, there are things to keep in mind when considering fence installation. There are permits and laws surrounding fence installation, so having a fence properly installed to state standards is why you should hire a professional residential fence company. For example, in Durham, CT, fences that run along the rear and side yard property cannot be taller than 6 feet. There are also different rules on property line setting. 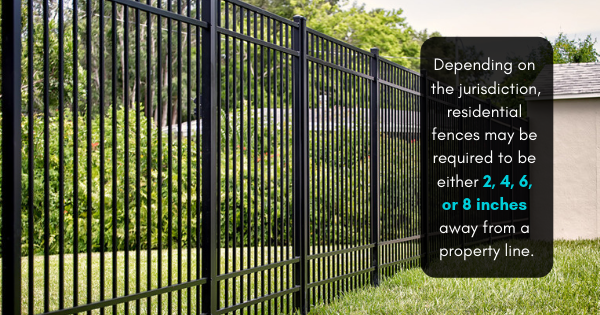 Depending on the jurisdiction, residential fences may be required to be either 2, 4, 6, or 8 inches away from a property line. Another thing to consider when thinking about fence installation is your needs for a fence. If you are looking for entering and exit home privacy, wooden entrance gates could be a good addition. For those with neighbors who live just a little too close, a privacy fence could benefit your home’s backyard. And for those with a pool, you may be needing a fence that provides a pool enclosure. If a pool enclosure is what you’re after, then you will need a permit in order to build your fence. You also have to think about the material you want your fence to be. Of course, a wooden fence is always a classic style, especially for those looking for things like wooden entrance gates. One thing to know, however, about wooden fences is that they will need to be painted or stained every two to three years. Residential fencing can also be steel or aluminum. There’s also the option of a PVC fence, which can be great at reducing the cost of your fence installation and upkeep. Our residential fence company can help you with all of your fencing needs, no matter what you need a fence for. We can answer your questions about wooden entrance gates, what materials to use, which design to choose, and so much more.